It wasn’t awful. It just took a lot longer than I had planned, because apparently I overestimate my abilities, especially on projects I haven’t made before. This took up most of yesterday’s sewing time, which took up most of yesterday. It was Friday and it was snowing. I cooked down two chickens for soup and sewed. The Necchi industrial did a great job sewing through all the layers of fabric, fleece, and vinyl without complaint, which is saying something considering that the only motive power to that machine is being provided by my legs. By far, the hardest part was getting the tubular frame into the bag. That took 45 minutes. I like the size. In the picture above, the bag is stuffed with four bath towels. It’s pretty roomy. The lining isn’t that baggy; I am trying to hold the bag up and take a picture at the same time. I didn’t put any pockets either inside or outside. 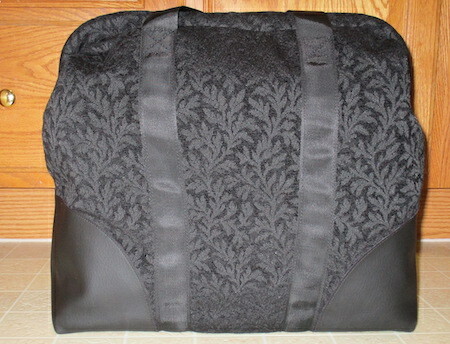 If I make this bag again, perhaps I will. The seatbelt webbing I received was not quite what I had expected. I had hoped to order something along the lines of the nylon webbing I bought at Pacific Fabrics in Seattle in November. I found something on Amazon that looked similar; what I got is actually thinner and shinier than what I had on hand. It’s also a nylon webbing, so it’s very strong, but it almost looks like grosgrain ribbon on this bag. I wish the bolt of webbing at Pacific Fabrics had had some kind of manufacturer information on it. I suppose I could call them and order more, or ask who makes it, but based on the help I got when I was there, I am not holding my breath. I might just wait until the next time I’m in Seattle. Will I use this? Definitely. I think it’s the perfect size for an overnight bag. It certainly looks classy. Are there mistakes? Oh yes. The purse feet aren’t spaced exactly (who is going to measure?) and the handles could be better, but those are the kinds of issues you’d expect from a challenging pattern that took three tries to complete. Would I make it again? Yes, but with some modifications. I talked to Cristina about some bag and sewing machine issues yesterday—she has the same Necchi BV industrial that I do—and she suggested I try Decovil interfacing instead of fleece. I have some Decovil but haven’t worked with it yet. I do prefer fleece to foam. There is just something about the feel of foam that I don’t like. I showed this to the husband last night and he said, “How many bags do you have?” A lot. I have a lot of bags. I am thinking of having another giveaway here on the blog soon. I think I am going to take a break from bags today, though, and work on my Rhapso-T. My new supply of tracing paper arrived and DD#2 helped me take measurements over break. I really have no reason not to work on it. Spring will get here eventually and with it, the need for some T-shirts. I should get started. The domestic serger needs a good cleaning and new needles. This would be a good excuse to do some maintenance.